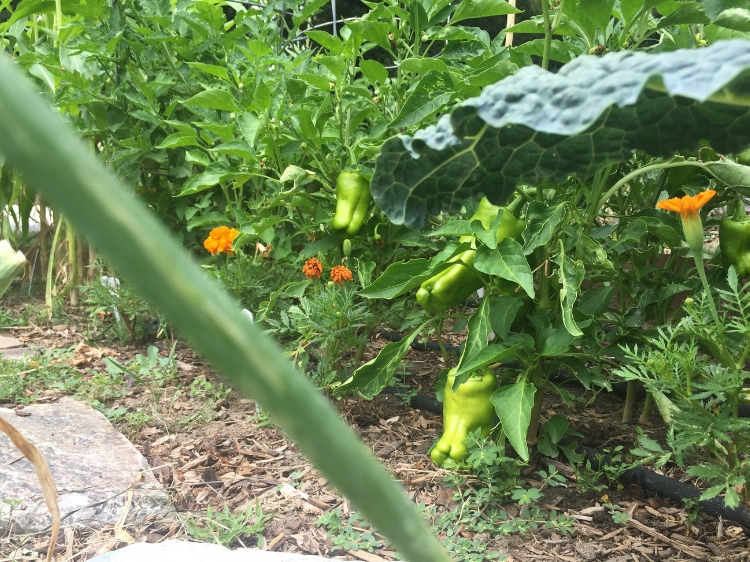 Growing peppers has been one of my favorite things about gardening. 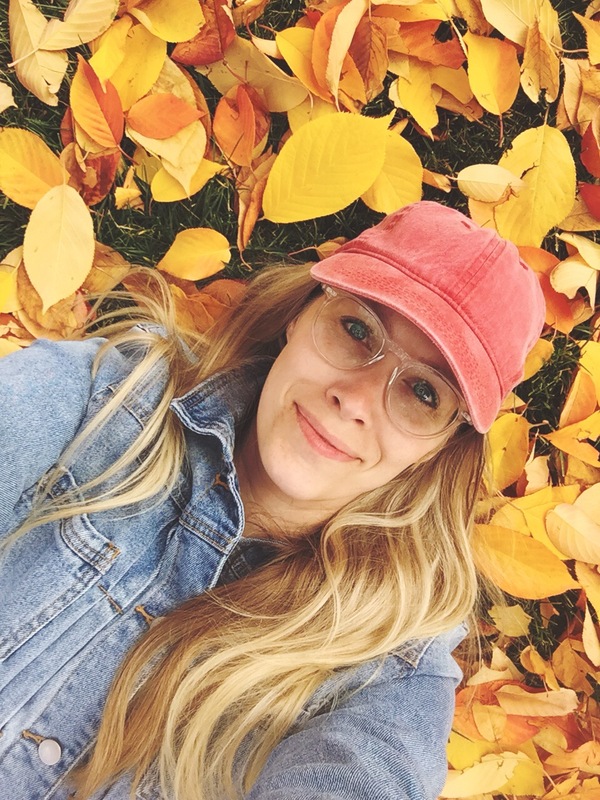 They are delicious, come in a wide variety and seem to love Utah's dry heat. They did fantastic on my patio in the the heat, and produced like gangbusters in my new yard. 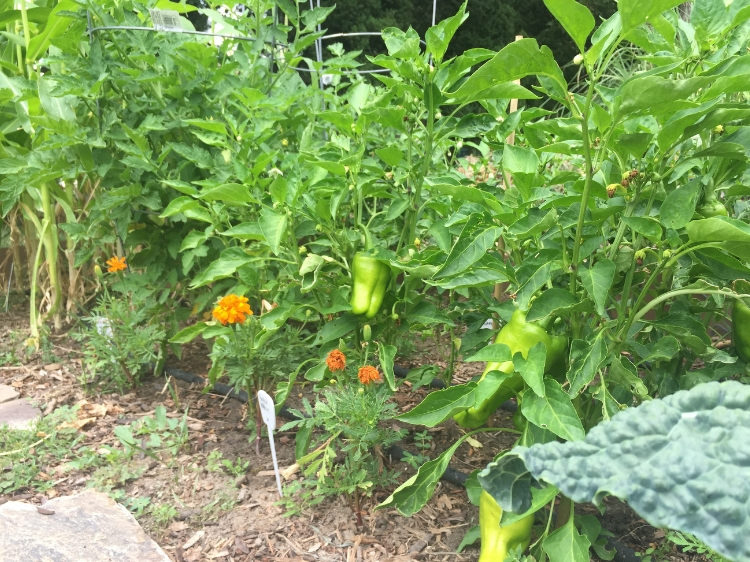 My favorites that I've grown so far are jalapeños, hot banana peppers, and Sweet Sublime. They're also easy to grow from seed indoors, and have transplanted well into my garden from my own homegrown seedlings or from garden centers. They're easy to store, and can be used in just about every dish you make. 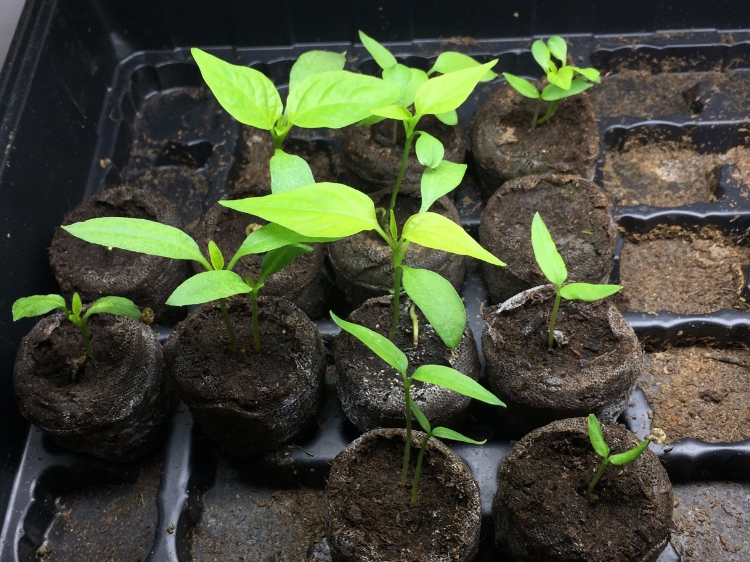 When starting your peppers from seed indoors, plant the seeds in your seed starting soil mix, and keep moist and warm. Make sure to give them lots of light as well. If you start them in seed pellets, as soon as roots pop out the bottom, plant them in a small nursery pot or 16 oz cup. Keep them under regular even light so they bush out evenly. If they start to get leggy from reaching toward the light, prune the top sections off, but leave a few leaf sets and it will force leaf formation on the stem. Once your outdoor planting date is close, you'll want to harden your plants off outside in a bright and indirectly sunny spot (but bring them in if temperatures dip below 50°F). Your plants are soft from growing indoors and too much sun, wind or other elements will harm them until they have hardened off. This process takes a week or so, but once it's done you have sturdy strong plants that can survive outside! 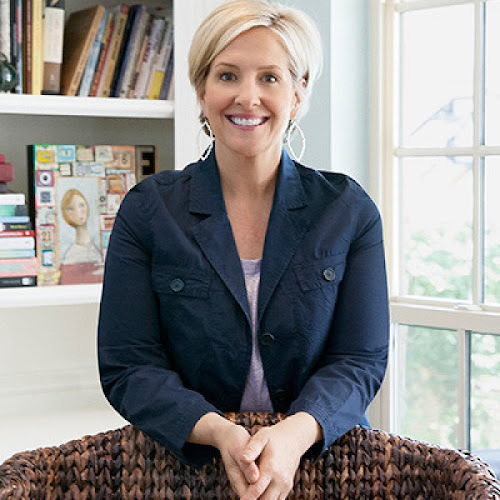 See this post for how I start my seeds and what I use. 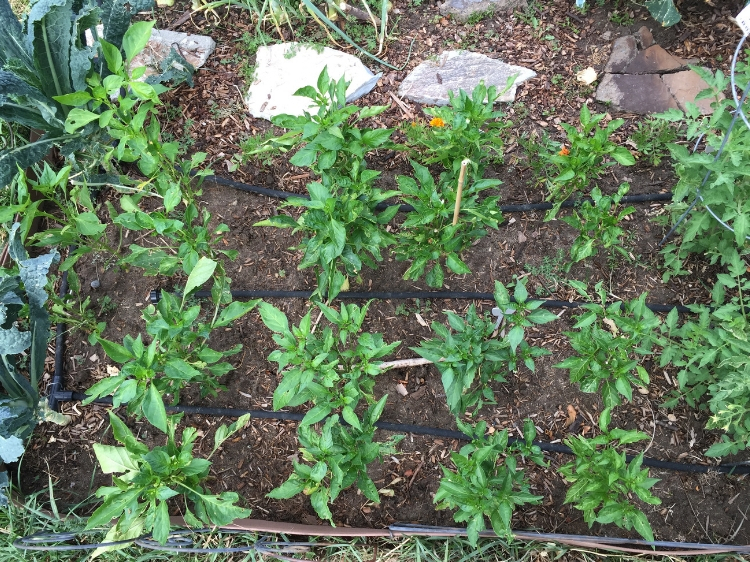 See this post for how to prune leggy peppers. Any pot at least 12 inches in diameter and depth is a good fit for peppers, however, bigger is better. 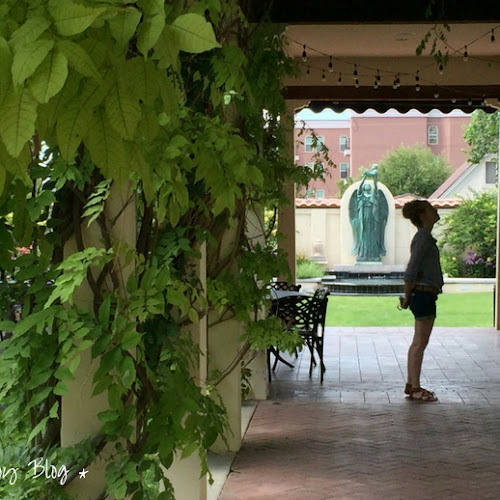 If you choose a plastic pot, the dirt won't dry out as quickly as a clay pot. Make sure the pot has good drainage holes or the pepper roots will rot. Because your pepper plants are being grown in pots, you'll want a soil rich with nutrients. Choose a fluffy potting soil that allows for good water retention but also good drainage. A lot of times the fluffier potting soils come filled with lots of fertilizer and plant food in it already, which gets your plants off to a good start. It's best not to use soil from your garden or nearby flower beds as it is likely to be full of possible pests or diseases. You can also try a slow release fertilizer that will add additional nutrients slowly over a long period while there is active fruit production. Plant seedlings out after all danger of frost has passed. 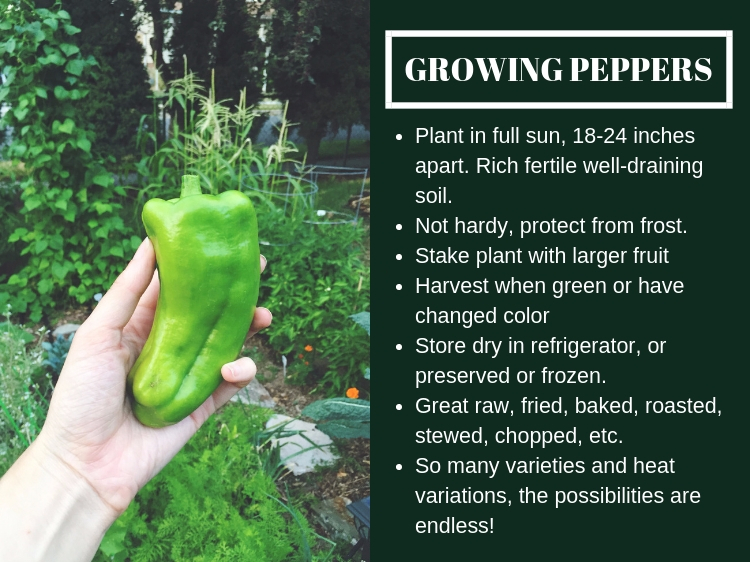 Peppers are a warm weather plant and will not be happy in the cold of fall or early spring. When planting a seedling, make sure to plant the seedling the depth it was planted in its nursery pot. Depending on the type of pepper plant, it may be good to stake it. 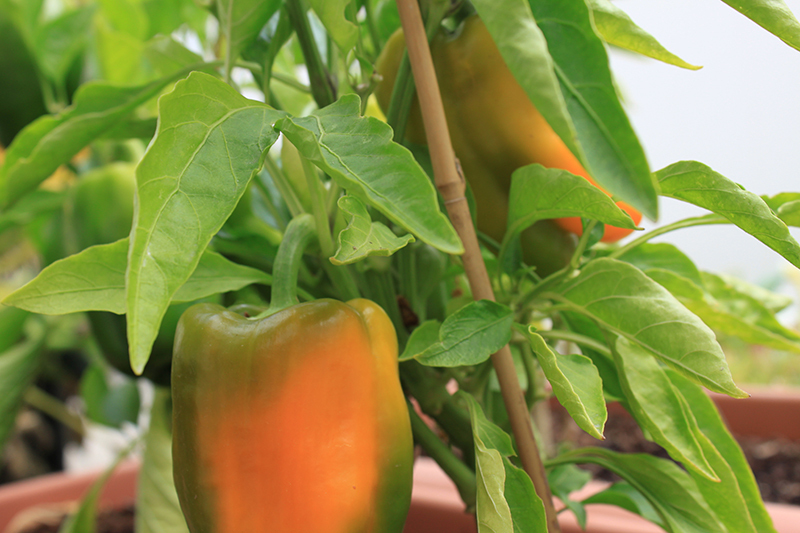 Some peppers grow large fruits, and will need some support during fruiting time. Be sure to place the stakes at planting time. Staking after it's been growing can hurt the roots since they'll spread out. 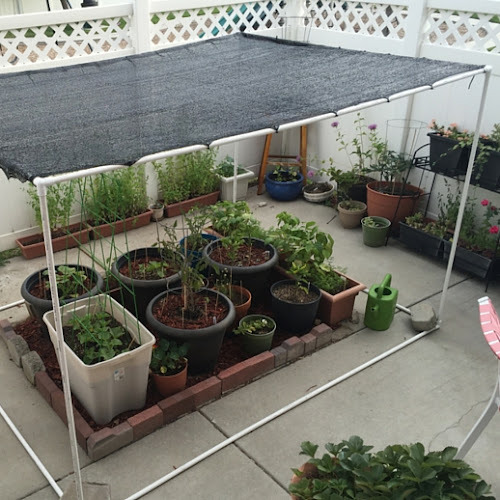 For staking, you can use a small tomato cage for pepper plants that grow larger fruit. Or, tying the plant to a stake as it grows taller works as well. 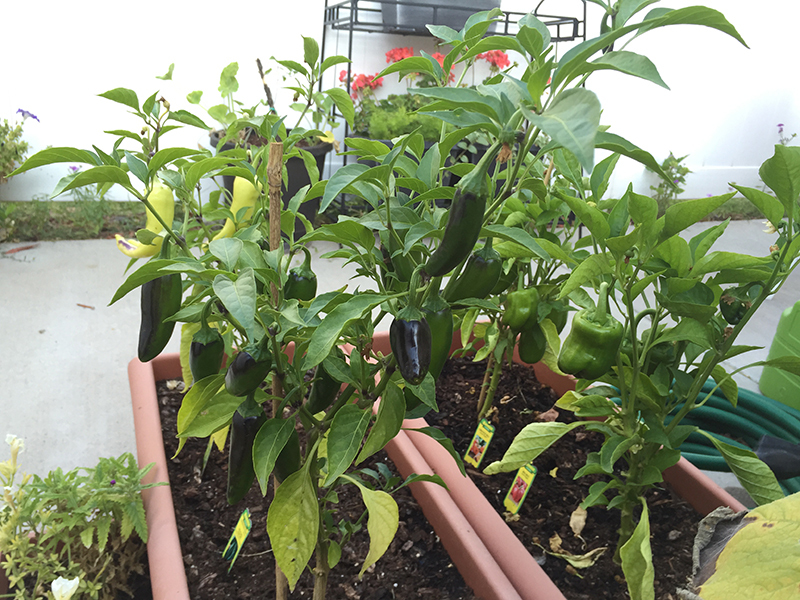 Plant peppers in a sunny spot with at least 6-8 hours of sun per day. 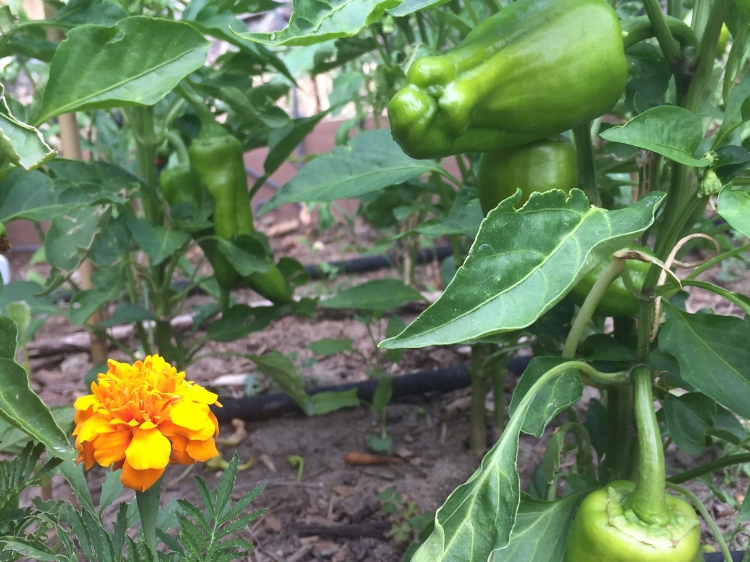 Peppers need 1-2 inches of water a week minimum, but do not like soggy soil. So water on a regular schedule, and make sure the soil is draining well. 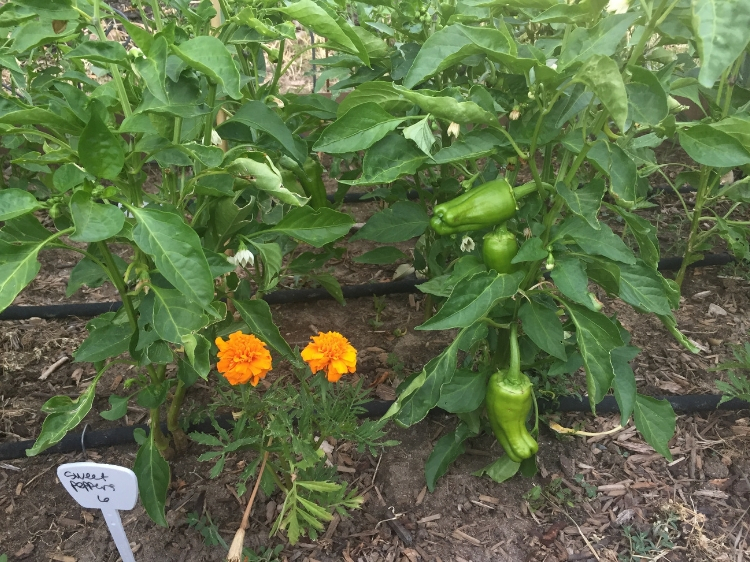 When fertilizing, water the pepper plant first, and then fertilize it after. This protects the plant from fertilizer burn. Harvest the mature peppers regularly to keep the plant producing. To encourage fruit formation, tickle the inside of the flower blossom with your finger. This helps push the pollen to the back of the flower where it will pollinate and turn into fruit! To harvest peppers, use kitchen shears or scissors to snip the stem just above the ripened fruit. Pulling them off the plant can actually uproot the plant since pepper stems are very sturdy. You can also twist the pepper until the stem above the fruit breaks. 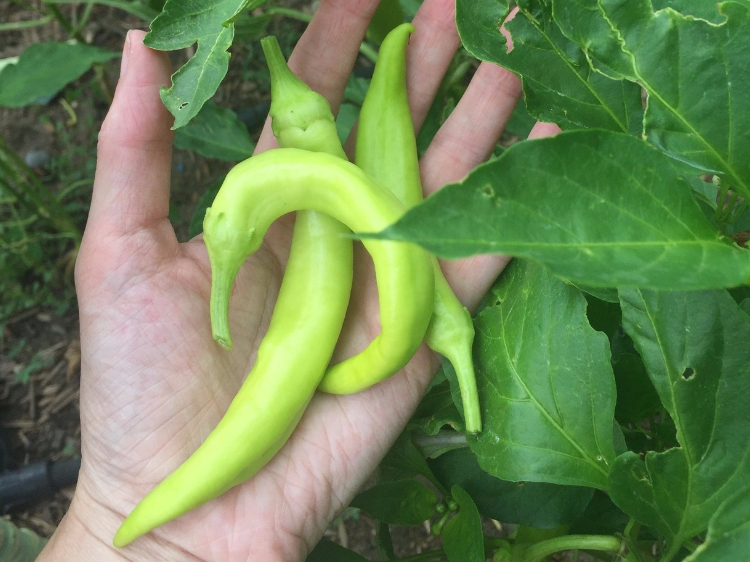 Most peppers are ripe when they turn the color they're supposed to be. However, some peppers can be eaten while still green. Jalapeños are hottest when red but still pack heat when they're green. 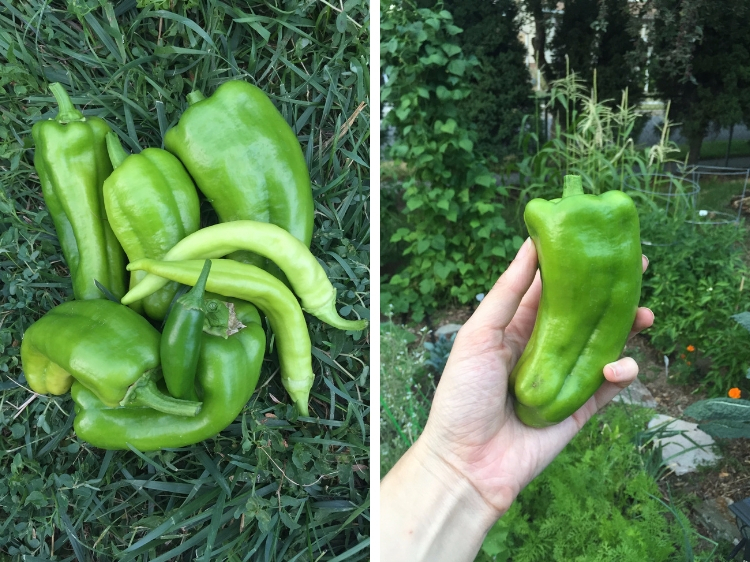 Bell peppers can be eaten green or whatever color they're supposed to turn. Refrigerate peppers, unwashed, in a plastic bag in the vegetable drawer. Keep them dry, as moisture will eventually cause them to rot. 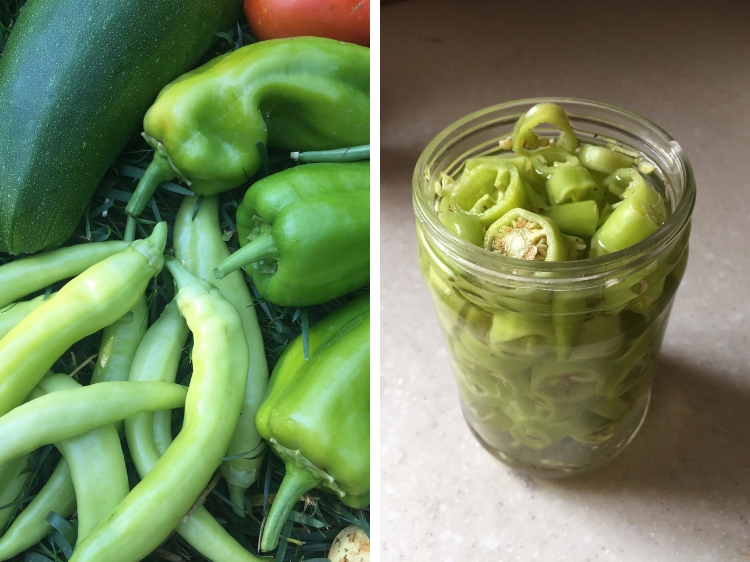 Peppers can also be preserved, pickled, or frozen. We like to put ours in stir fries, omelets, veggie scrambles, soups, roasted dishes, grilled, casseroles, and whatever else we can think of. I've even pickled the banana peppers in rings so we can use them on sandwiches. 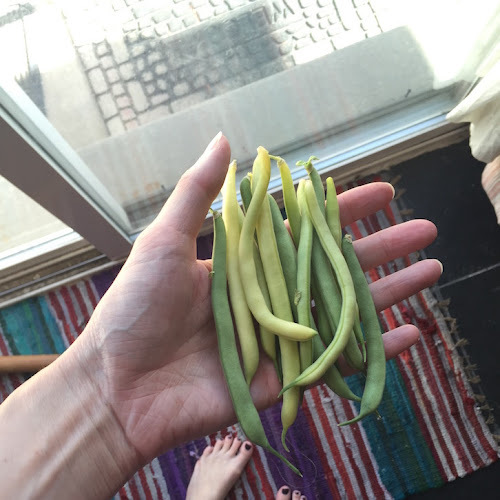 The best part about growing them yourself is, they stay fresh for much longer than store-bought peppers because they go straight from your garden to your kitchen instead of being trucked and refrigerated for days before you get them. 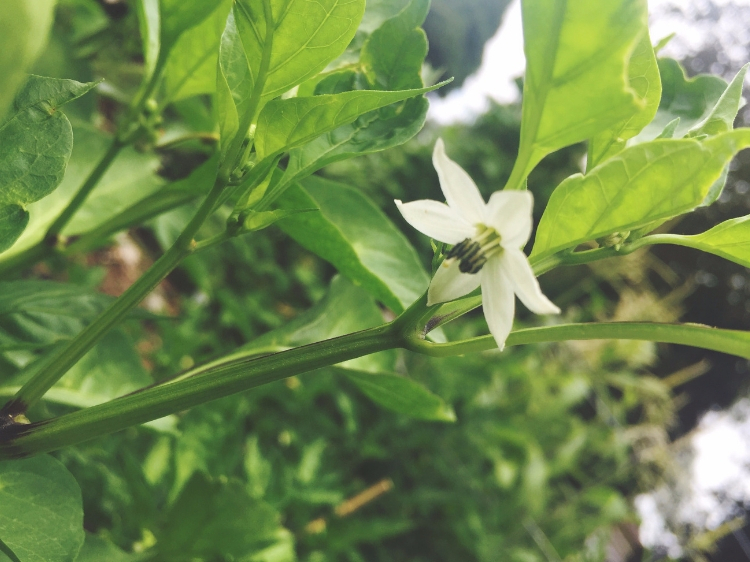 The common diseases or pests that attack peppers are aphids, flea beetles, cucumber mosaic virus, blossom end rot that appears as a sunken area that is softer and turns darker. Also, if temperatures are below 60°F or above 90°F pollination can be reduced. If you fertilize with too much nitrogen, it will reduce the amount of fruit that sets and cause leafier plants. 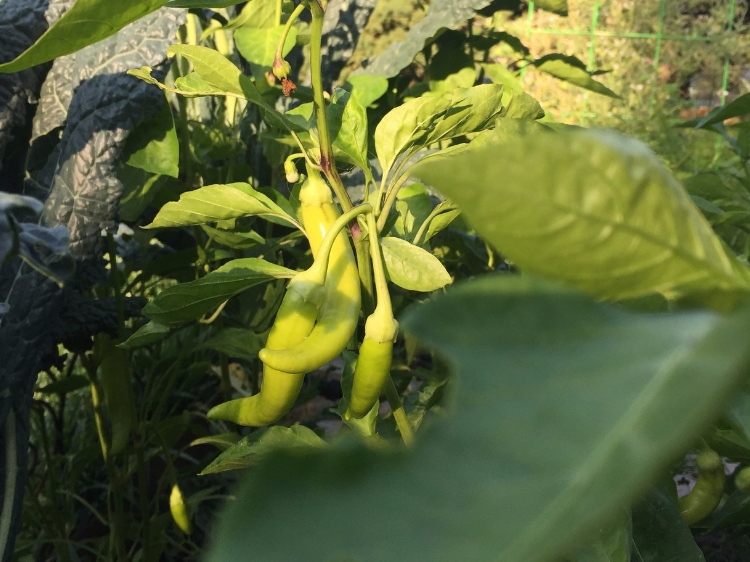 Hot peppers that have turned their ripe color will likely pack the most heat. Be very careful while handling them. Capsaicin, which is the oil from peppers that gives them their heat, is mostly concentrated in the veins, ribs and seeds. This can get stuck in your finger nails, and is often not discovered until you rub your eyes or nose. Be careful to not get the juice in your eyes or nose, and if that happens flush immediately with cold water. If your mouth is on fire, try eating yogurt or drinking milk to take away the burn. Also, blue Dawn dish soap can take the oil from under your nails. I learned this the hard way when handling serrano peppers. I got the oils under my nails and couldn't get it to wash off. I found out it was still there hours later by putting my contacts in with the oil on my fingertips. The only thing I could do was flush my eyes with eyedrops, and wait thirty minutes for them to water themselves clean. Blue Dawn was the only thing that got rid of the oil under my nails. Not a fun way to discover the power of Capsaicin!